2012 Urbana Arts Grant Recipient: REsonance: Touch here. Listen. Today, we highlight another Urbana Arts Grants-sponsored project: REsonance: Touch here. Listen. This project, created by Grant Bowen, aims to foster an appreciation for all the ways in which we listen to the world. REsonance is an installation exploring the act of listening through unconventional ways, such as sculpture, sound, light, and performance. The full show and reception will occur next Saturday, May 5th from 7 to 9:30 PM at Meadowbrook Park. 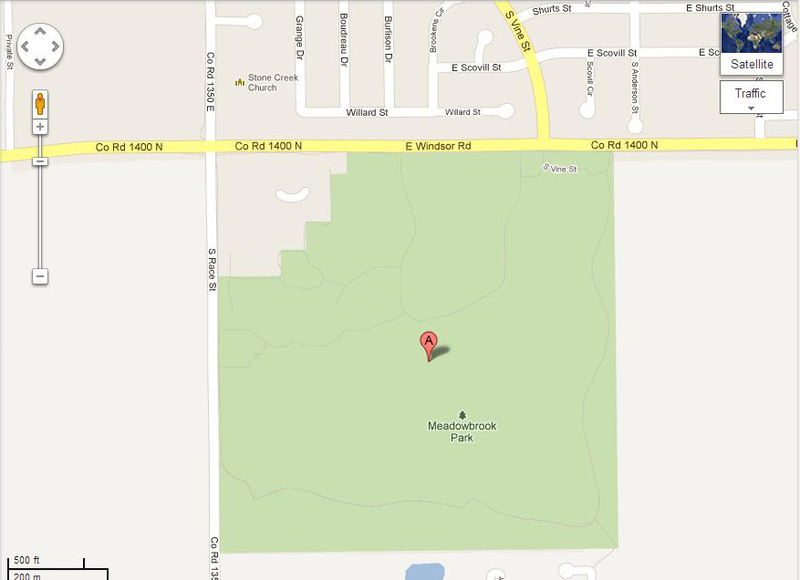 REsonance will take place at Meadowbrook Park, located at Windsor Road and South Race Street. Grant Bowen, the mastermind behind this project, was kind enough to speak with us about his work and answer some of our questions. Read what he has to say and see some photos of the project in progress, after the jump! 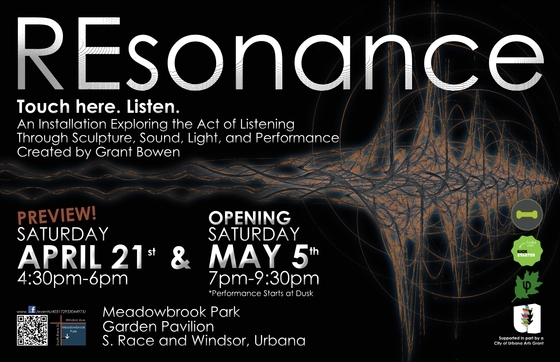 Urbana Public Art: REsonance is an installation revolving around three main structures, “Acoustic Light Forest,” “Non-Newtonian Sound Pools,” and “Mirrored Heartbeats.” Could you elaborate a bit on each of these structures, and talk about how you came up with the ideas for these structures? Grant Bowen: The ideas for REsonance grew out of an exploration of my own hearing impairment and my relationship to sound, because I have been classified as “severely and profoundly” hearing impaired since I was five years old. During that exploration, I started to wonder about the differences between hearing, a physically quantifiable sense, and the idea of listening, which is more of a subjective understanding of the vibrations in the air. I feel that despite my hearing (or lack thereof), I have always been able to listen pretty well. When I started researching what I wanted to do for REsonance, it really became about finding interesting ways to talk about sound waves, and how we perceive them. With the idea of translating sound waves into other sensory perceptions, I came up with the structures that you will see at the Garden Pavilion on May 5th. The first one, the “Acoustic Light Forest,” was driven out of this idea that the earth constantly responds to us, and the energy we are giving off all the time; however, this response is so small and below our radar that we hardly notice it. I thought it would be great if we could somehow highlight this back and forth between our own movements and the living earth. 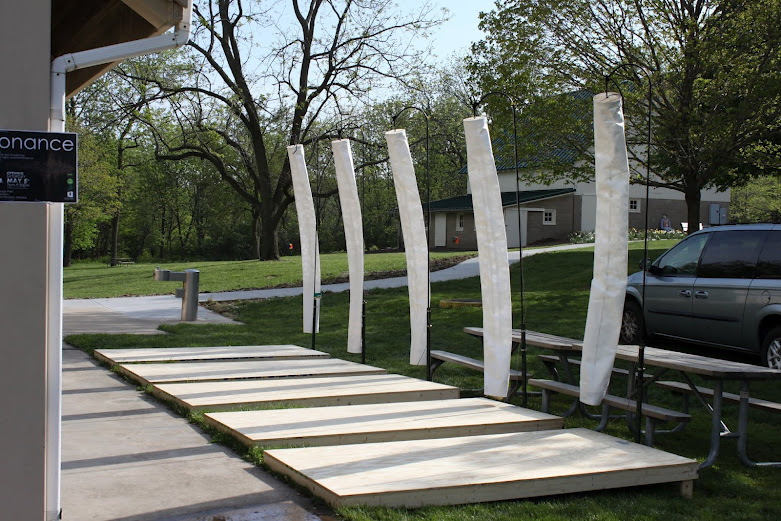 So the structure is basically a series of white tubes, or “trees,” that line the perimeter of the pavilion. The “trees” are attached to a platform that has sensors embedded in it. As you move around the platform, the “tree” lights up, changing in intensity as you move closer to it. 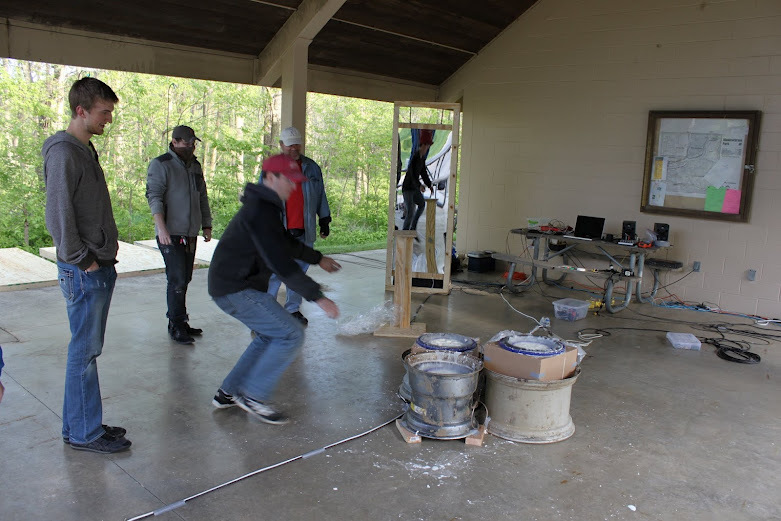 The second, the “Non-Newtonian Sound Pools” started with a YouTube video (Non-Newtonian Fluid on a Speaker Cone- http://youtu.be/3zoTKXXNQIU) “Non-Newtonian Fluid” is just a fancy way of saying “cornstarch and water.” I thought the shapes created were so amazing, and I wanted to A) make it larger and B) connect it [with] audience movement. So basically what we came up with is an interactive camera interface, where we have a computer tracking the viewer and changing the frequency coming out of the speaker based on where the viewer moves. The third structure, “Mirrored Heartbeats” came out of the idea that we are always putting out low level sound frequencies through our heartbeats. Personally, I think that we can sense this everyday but, once again, we almost never notice it. So with the Mirrors, we decided to amplify the heartbeat of the viewers, and then send it back to them with more energy than they are used to experiencing. Initially this was going to be a sensor that people could interact with , but now it is more of a sound-scape we are creating within the pavilion. Although this is not interactive, I think it really highlights the connection between sound and our own bodily processes. UPA: I saw that there is also a performance happening on the night of the reception. Could you explain a little about what the performance involves? GB: One thing that was most important to me in planning this project was the connection of movement, sound and senses. Very early on it was apparent that having people on hand to move through the space, to guide the audience through what these experiences could be, was going to be invaluable. For the past year or so, I have become intensely interested in Dance Improvisations as a tool for expression. So for REsonance, I have invited a few dancers, (Jessica Cornish, Alana Parekh and Tamin Totzke) to come and explore the space through an improvised movement performance. I would love it if I could have had more dancers involved, but that just has not worked out so far. With that in mind, anyone who is interested in doing an improvised performance in the space is more than willing to get in touch with me. So, like I said, it will be improvised, so I’m not exactly sure how it will turn out. But, knowing the dancers involved (plus there will be really cool lighting), I think it will be quite beautiful. UBA: What are you hoping the viewers of your project gain from the experience? I am hoping that viewers of REsonance: Touch here. Listen. will be able to walk away from this experience with a new sense of sound and how their energy can affect the world. But perhaps more importantly, I hope people will come away feeling just a little bit more connected to the world they inhabit, and to the people around them. For me, all art is about building community, and finding ways to share ourselves with each other. Whether that is an artist sharing his thoughts with the world, or two viewers sharing an experience together, art is always about the joy created when we share our lives with our community. Grant would also like to thank all of the people who have helped get this project up and running, and he would especially like to thank his collaborators–Jeff Zahos, Tony Reimer, Robert Brown, JP Ankrom, Rachel Storm, and Jess Gersz. This entry was posted in Uncategorized and tagged art, bowen, grant, listen, public, resonance, touch, urbana. Bookmark the permalink.